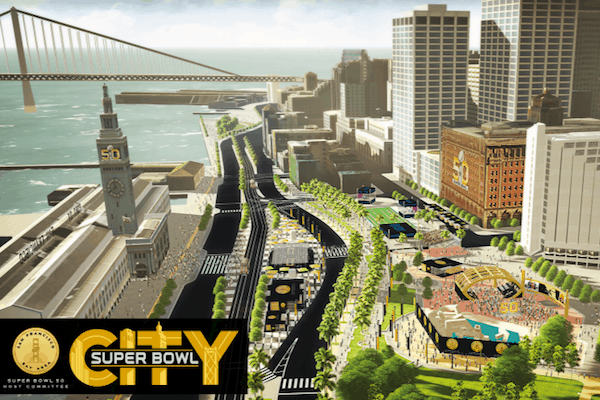 From 1/23 to 2/12, street closures will be in effect for 2 major Super Bowl events: Super Bowl City (a fan village in front of the Ferry Building and on Market Street) that will be free to the public and the NFL Experience and a pro football interactive theme park at Moscone Center. The SFMTA is encouraging visitors & commuters to use the transit system or arrive by foot or bike. For people coming in from outside of the city, it will be best to park at a garage outside of the city and arrive by Caltrain, BART, or ferry. The Super Bowl Events will take place from 1/30 to 2/7, however many streets will be closed for a longer time to allow for setup and break down. There will be detour routes, however they will likely be very congested. Parking will be limited to make room for transit, emergency vehicles and event loading. For parking alternatives outside the Super Bowl City zone, check out the city parking page. Things will be a little confusing for a bit, but the more people that leave their cars at home, the better the traffic will be. Check out the San Francisco Party Bus for Shuttles to the Dave Matthews Band Concert, Pharrell Concert and The Super Bowl!